In the previous post, we have learned that the segment connecting the two sides of the triangle is parallel to the third side and half its length. In this post, we are going to use the said theorem to prove that the midpoints of any quadrilateral determine a parallelogram. 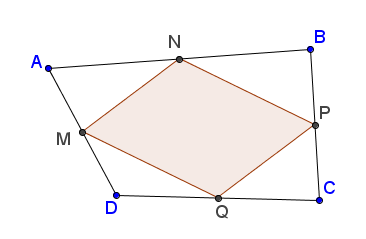 Given quadrilateral and midpoints , , , as shown as above, is a parallelogram. To show that is a parallelogram, we have to show that their opposite sides are parallel (definition). That is, we have to show that and . The quadrilateral formed by joining the consecutive midpoints of another quadrilateral is a parallelogram. Quadrilateral . latex N$, , are midpoints of , , and respectively. is the midsegment of triangle , so is parallel to . is also a midsegment of triangle , so is parallel to . is parallel to and is parallel to , by transitivity, is parallel to . It remains to show that is parallel to . is a midsegment of triangle , so is parallel to . Since is parallel to and is parallel to , by transitivity, is parallel . Since is parallel to , and is parallel to , is a parallelogram (by definition).